Since the iPad was out its been widely suggested for use as a touch screen kiosk. It was an ideal kiosk for libraries, museums, art galleries and now bars? Meet the Kegmate, the iPad powered beer monitor giving you access to a ton of information about your beer. 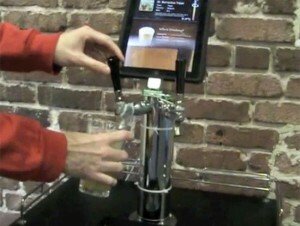 The KegMate iPad application was developed by folks at Yelp. KegMate can give users a ton of information. It works with RFID tags and can monitor who is drinking how much from certain kegs. It also gives information about how much a person has consumed and can also let people rate their beer on the screen. Other information that the KegMate gives out is the temperature for the beer and a person can actually remote into the app to check the kegs usage and its temperature remotely. All this is possible because of the sensors that are attached to the keg that feeds the data into an Arduino microcontroller which works with the iPad over a serial connection. The iPad uses its wireless capabilites to communicate with the RFID’s. Enjoy the video where the developers of the system explain its workings. The best thing about this system? You don’t have to tip this sucker! Previous Google Will Soon Own You!